We’ll take any of that you don’t want. We’ve got the first part: slightly lower temps. But we’re still waiting for the skies to open up. Thank you. I’ve been thinking about you all in Texas and really hoping you get rain soon. Oooo, Nat Geo magazine needs this pic! I’m serious. They do a contest every month and put in pics from folks that send in their pictures. Can’t hurt to try? Stormy skies are good news in NM, right? 😉 We could use some this way, too, as a matter of fact. In moderation, yes. 🙂 I’ll wish some your way too. I hope you and Miss Chef have a wonderful Labor Day weekend. Lovely photo- have a great weekend! Thank you. You too. Give Beamer a big hug from all of us. Great photo! Would you kindly have that storm blow over to your neighbors in AZ? We have had a terrible (non-existant) monsoon this summer. We’ve gotten some, but still not enough. More would be nice. Have an awesome weekend. Ah Justina, a wonderful photo! 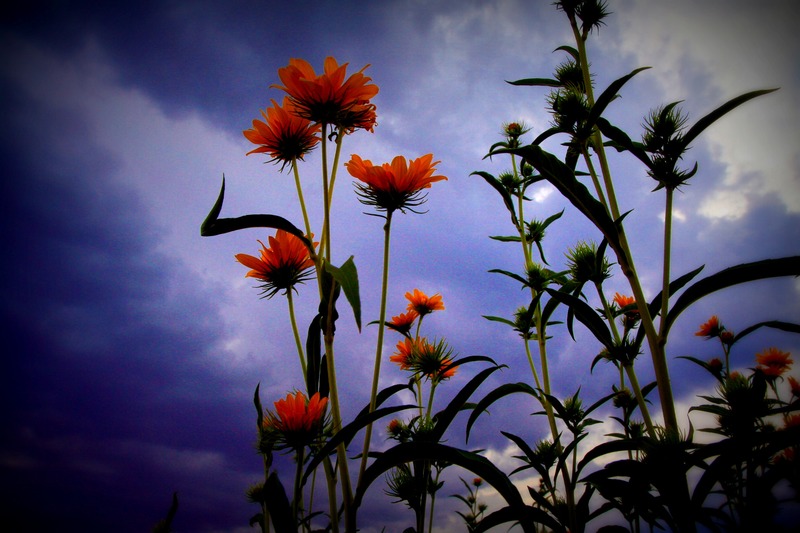 The flowers, the sky, the composition of colors…. love it! Thank you! 🙂 Have a wonderful weekend! Wishing you just the right amount of rain! Thank you! Wishing you a wonderful weekend. Lovely shot – what kind of flowers are those, do you know? I can answer both of those questions. 2. You betcha! 🙂 Sending happy wishes back to all of you. Oh my….love those NM skys. So vivid. Yes, they are. Thank you again for your wonderful, wonderful recipe. Yum. Beautiful! I love how the flowers are set off by the dark sky. Beautiful composition! Love stormy sky, too. Thank you! Sending warm thoughts your way this weekend.